Les Baux-de-Provence is situated at the top of the picturesque Alpilles mountains. It is less than an hour away from many of the major cities in Provence, making it an easy day trip, or even a great place to stay overnight on your way to your next destination. It is a place steeped in history and hidden away from modernization. Standing atop the now ruined castle which once crowned this rocky landscape, it feels like you can see the entirety of Provence spread out before you. Looking out upon the town, it is sometimes hard to make out what is the rock and what are the buildings. The amalgamation of the natural environment and the manmade town is what makes this city so intriguing. 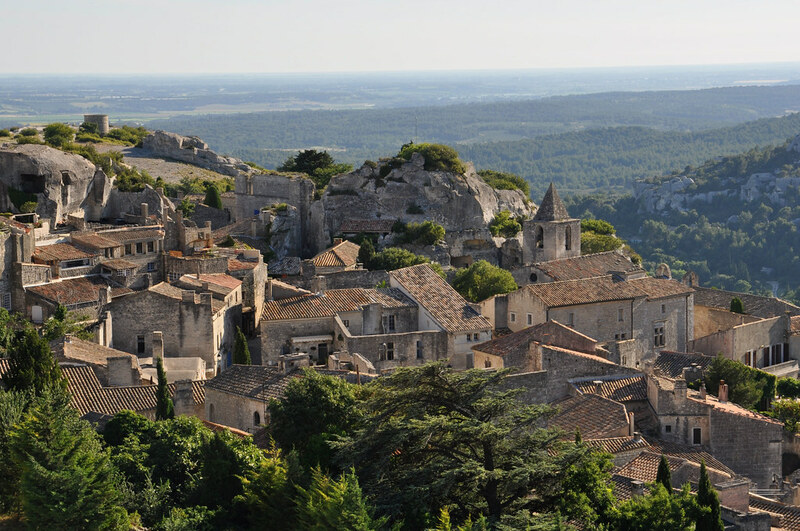 Les Baux-de-Provence has been home to the people of France as far back as 6000 BC but it wasn't until the Middle Ages that the town became a military stronghold for the villages surrounding it. The original fortress was built in the 11th-13th century and became known all over France as one of the most formidable citadels in the country. Today, the ruins of the castle and tiny village below are a popular destination for tourists, taking a peek into Provence's past. Les-Baux has dozens of quaint little hotels and chateaus where you can lay your head for a night or for the entirety of your stay. Often you can find the most charming options outside the most popular cities, so you if you have a car and are making your way around Provence, consider spending a night or two in Les-Baux at one of their many desirable hotels. Hotel Le Madaleno is extremely reasonably priced for the historic and luxurious setting! It's red painted facade with green shudders and ivy-covered exterior makes it a joy to look at from their crystal clear swimming pool. Since the historic part of Les-Baux closes before dinner, most hotels in the area offer their own dinner service. Dining alfresco, under the fairy lights is one of the best parts of this hotel stay. Double rooms range from €79 - €99. Book through their website and save yourself 5%! Le Mas Des Carassins in an oasis in Saint Remy, just a few minutes from Les-Baux. The hotel is located inside an old, stone farmhouse built in the 19th century. The private grounds, large swimming pool and lush gardens nestled in the tree-lined hillside all act as a stunning backdrop to the cosy hotel. Standard Rooms go for €112 - €152 but if you're looking for something more opulent and large, book yourself a suite, perfect for a week-long stay. If you're looking to splash out some extra cash and want to feel what it was like to live as a French courtier then Chateau de Roussan is for you. This chateau is home to herds of sheep, beautiful parklands and, of course, the french countryside. I love the fact that the chateau didn't renovate everything to the extreme when turning the old manor into a guest hotel. They let the place feel lived in, and as such, it feels homier than hotely. Double rooms cost between €205 - €255 and Suites run €335 - €415. To arrive in Les-Baux from Arles take the D17 highway through the scenic hillsides. From Avignon take the D570N. Both ways take around 30-40mins but be prepared to stop along the way. There are so many little vignettes of French country life along the roadside, so take your time and soak in all those little roadside attractions. When you arrive in Les-Baux there is a free parking lot where you can leave your car for the day which I've marked on the map at the bottom of the post. There are some additional pay parking lots if this one is full ranging from 4-5 euros for the entire day. So either way, it's not too expensive to leave your car here while you go exploring. If you happen not to be travelling by car through Provence, various taxi companies can arrange to drive you out to Les-Baux and schedule a time to bring you home. Talk to the concierge at your hotel for more information. This should cost you about 30-50 euros each way. While it's not a cheap option, it is super convenient if you don't have another means of transportation. If you prefer to take the bus, #59 from Saint Remy or Arles will take you right up to Les-Baux although the schedule is restricted and often times not running outside high tourist season. Tickets only cost 2,20€ so it's worth looking into if the timing works out. Check the schedule for more information. 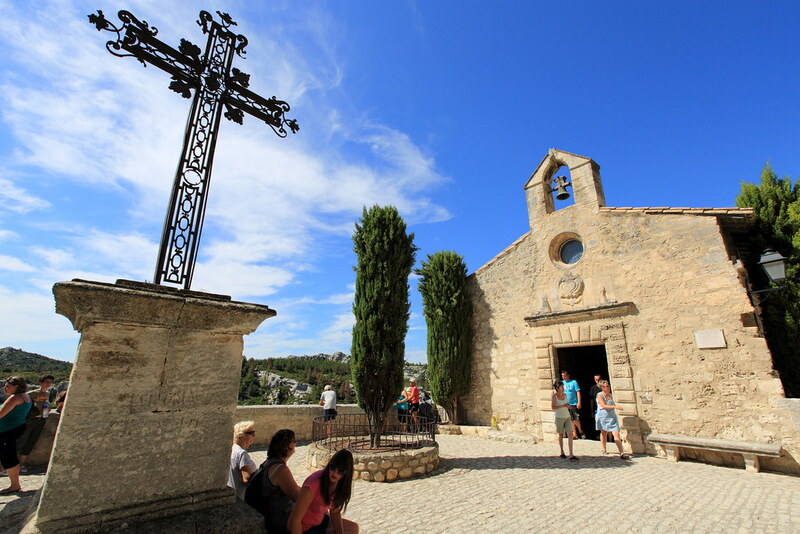 There are also tour bus companies which run day trips to Les-Baux but I often find these are rushed and tend to make superfluous stops along the way, when you'd much prefer to spend quality time in one place. After parking your car, head into the lower town. The lower town is where the villagers lived when the castle was in full swing. The small streets and stone houses are now home to various restaurants, tourist shops and museums. While some people complain that the tourist trade has invaded the humble town, there is still plenty of history steeped in these walls. The key to exploring the lower town is to look past the tourist shops, poke your head into tiny, seemingly empty alleyways, look up above the storefronts to see pieces of the past poking their heads out of the stone walls. When you first enter the town, stop off at the tourist office, situated right inside the city gates. 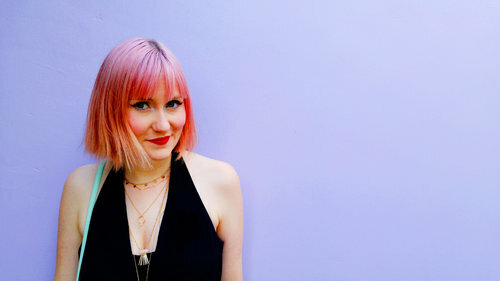 Here you can get a free map of the city, a list of exhibitions as well as pick up an audio guide if you prefer to follow along with their guided audio system. Throughout the village and castle ruins, there are dozens of numbered plaques which you can punch into the audio guide to get more detailed insights into the history of Les-Baux. If you aren't in a rush your first stop should be at the Santon Museum. A 'santon' is a small hand-painted figure made out of terracotta. 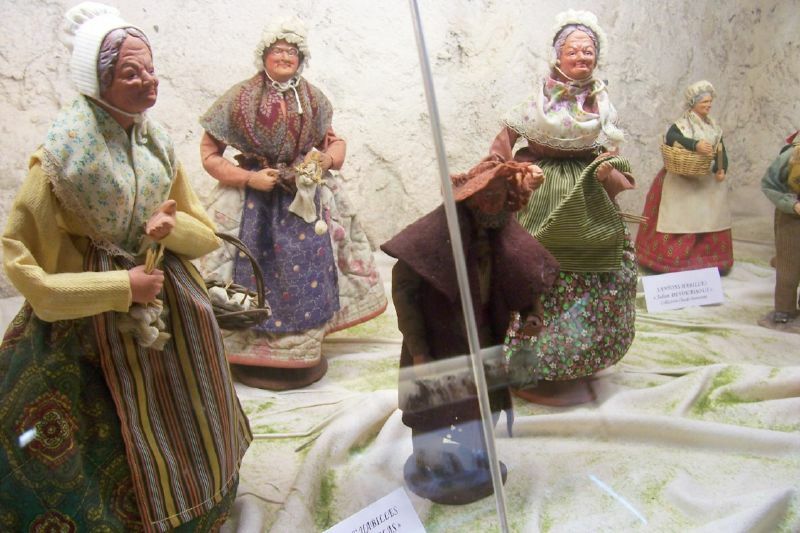 They were originally produced to portray scenes of the nativity but also depict historical scenes of Provençal life. Even if you're not interested in going inside, walking around the front of the building is recommended since the museum is located inside the old guardhouse. The building itself still houses two dungeons built in the 16th century who houses prisoners until the Revolution. Continuing along Place Louis Jou, turn right at the fork in the road and head down the stairs towards the Eyguieres Gate. Until the 18th century, this gate was the only entry point into the city. 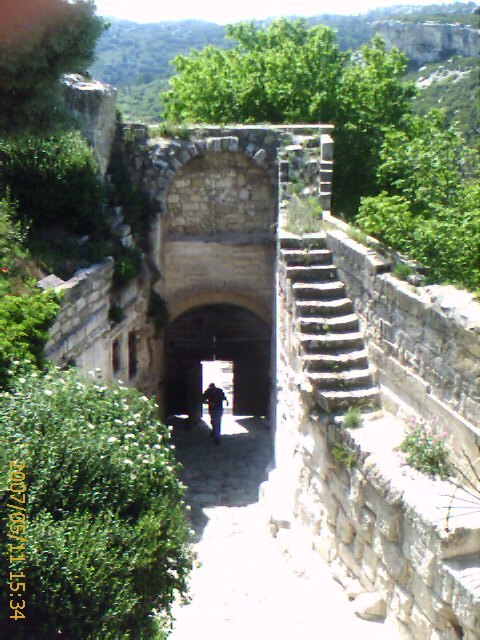 After the newly formed city gates were created, the Eyguieres Gate lead the villagers down towards the Fountain Valley below. Since there is little else to see and do down this way, the tourist crowds are much less intense here and you'll be surprised to see that you have this iconic place all to yourself. Look up at the top of the gate where you can still make out the coat-of-arms of the House of Grimaldi. The Italian Grimaldi family helped Louis XIII defeat the Spanish in the 16th century and were gifted the town of Les-Baux and Saint-Rémy-de-Provence as a reward for their service. To this day, you can still find their coat of arms throughout the city. If you're here around breakfast or lunch, there aren't too many quality restaurants in town. Despite it being such a wonderful place to visit the restaurants here leave much to be desired. There are a few exceptions and Les Baux Jus is one of those. It might not be for everyone, but this charming cafe serves up local, organic food and super fresh juice. They also provide a gluten-free menu if you have that dietary restriction. While it might seem a little trendy, there really isn't a better way to experience the natural splendour of Provençal produce than in its raw form. The next stop is Manville Mansion City Hall. The building originates from the 15th century and was created for a rich Protestant family named Manville. The Mansion was the first Renaissance design which graced the village and for the time was considered very "modern". Along the outside of the Mansion, you can study the luxurious millioned windows which provides a huge amount of light into the interior, something which was seen as a luxury in the Renassaince era. Later, after the Manville's moved out of Les-Baux. the mansion was transformed into the new City Hall. Today, you can come inside to see various art exhibits on display. Turning to the right, head towards the Yves Brayer Museum. Brayer was an expressionist like Van Gogh who spent the better part of his life in Les-Baux, inspired by the incredible landscapes which surrounded him. Entry is €8 per person but if you're interested in expressionist paintings, this is a joyful little museum. The museum is located inside one of the most magnificently preserved houses in town which is a nice bonus. Just past the Brayer Museum is Place St. Vincent. In the centre of the square stands an ancient cross surrounded by lush green trees. On either side of the square are two of the oldest buildings in Les-Baux; St. Vincent Church and the Church of Penitent. St. Vincent's is one of the three original town churches. This Romanesque church was built in the 12th century. While romanesque architecture might not be the most impressive and elaborate, there is something so humbling about the simplicity of its design. Inside, is a pure layout of a nave and two small side aisles complete with Romanesque arches. The funeral chapel inside the church is built right into the side of the rock. The chapel holds the remains of the Manville family whose mansion we saw earlier. The modern stained glass which was added in the 20th century gives a bright juxtaposition to the ancient rock and simplistic design. The Church of the Penitents was built in the 17th century for the Brotherhood of the White Penitents. The Brotherhood of the White Penitents were the most important sect of the Roman order and cared for the sick, buried the dead and provided medical services for the poor who could not afford private doctors. They even would raise money to give to poor girls for their doweries to ensure they could marry and provide a better life for their children then they were given. Before walking into the church, look up at the facade where you can see the relief showing two of the penitents kneeling below the carving of a dove. The interior of the church is very modest, but despite its size, it might surprise you. Inside, the entire room is covered in an enormous mural painted by Yves Brayer. The mural depicts the Shepherds' Christmas, painted in the golden yellows and cobalt blues which are synonymous with Provence. Before you head into the castle ruins, be sure you check to see if Une Table Au Soleil has any reservations left for dinner. It's a cosy little restaurant with quality food at good prices, which is often hard to find in highly touristy areas. 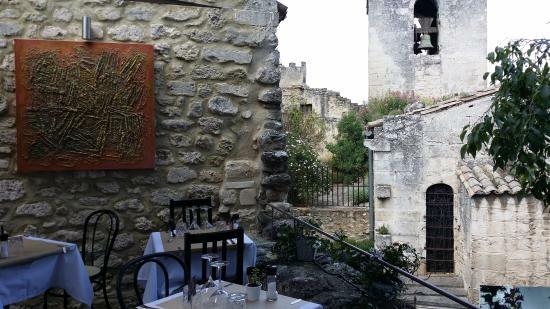 It's definitely a hidden gem in Les-Baux serving traditional French cuisine on a charming outdoor terrace. Since there are only 12 seats it is advisable to make a reservation before heading into the castle. Once you know the time of your reservations you can make sure you make your way out of the castle in good time. To enter the castle you need to purchase an admission ticket. Adult tickets cost €8 during the off-season and € 10.50 during the high season when there are performances and entertainment as a part of your ticket. You can also buy a combined ticket with the Carrières de Lumières. I HIGHLY recommend this since going with the combined ticket will save you a few euros and the Carrières de Lumières is a MUST DO while in Les-Baux. The castle is admission gate is open from 9:00 am to sunset (check the website for the exact schedule). But once you are through the gate you are welcome to stay as long as you want. Come the evening, there are so little tourists here you might think you have the entire place to yourself. Ghost hunters get a real kick out of exploring the area in the dark when the ruins are the perfect setting for spooky encounters. If you have the time, pack a picnic and enjoy the view as the sun sets behind the mountains. 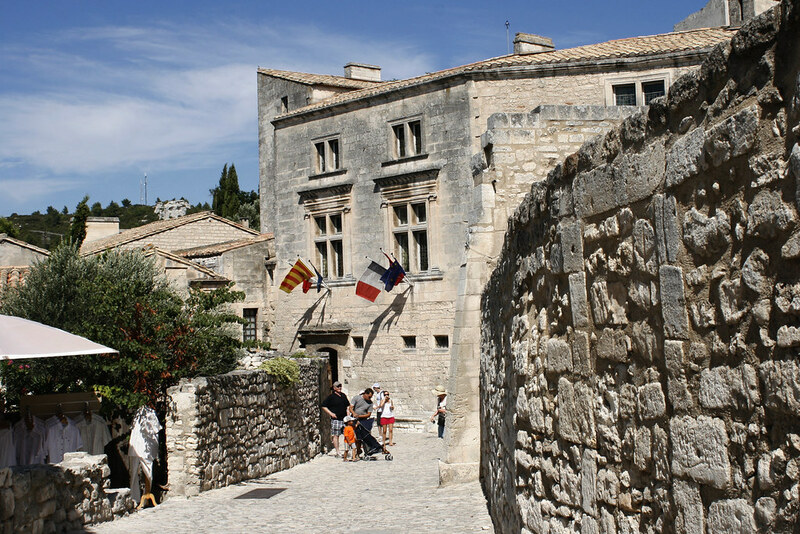 After winding your way through the narrow streets of the lower town, entering the castle is like taking a breath of fresh air. You walk out of the admissions office into the HUGE expanse of the hilltop ruins. Before heading out to explore the vestiges of the castle, take a moment to imagine the power and influence this enormous castle would have had in its heyday. The Lord of Les-Baux in the middle ages controlled more than 80 villages around Provence. When Les-Baux became an official part of France, the King wanted to make sure they knew their place and destroyed the once powerful fortress in 1426. The King couldn't bear the thought of anywhere in his country being more powerful than the throne where he sat. Although the Lords of Les-Baux attempted a few times to regain power, their castle was demolished for the last time in 1632. 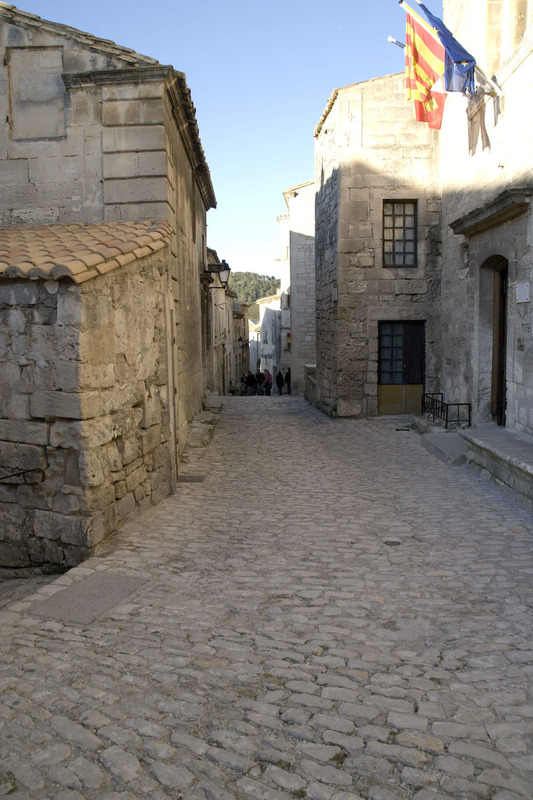 As the townspeople left, and the castle remained untouched the French people referred to Les-Baux as the 'ville morte' or the dead town. The rubble remained untouched for ages until later in the 1900s when interest in this ancient sites became popular and the tourist trade brought the city back to life. Say what you will about the cheesy souvenir shops and annoying tourists, tourism brought this forgotten town out of the darkness and without money from tourism the preservation of this ancient site wouldn't be possible. The small chapel of Saint Blaise is the first building you see when you come inside. This tiny chapel was built in the 12th century by the guild of weavers in honour of their patron Saint, Blaise. 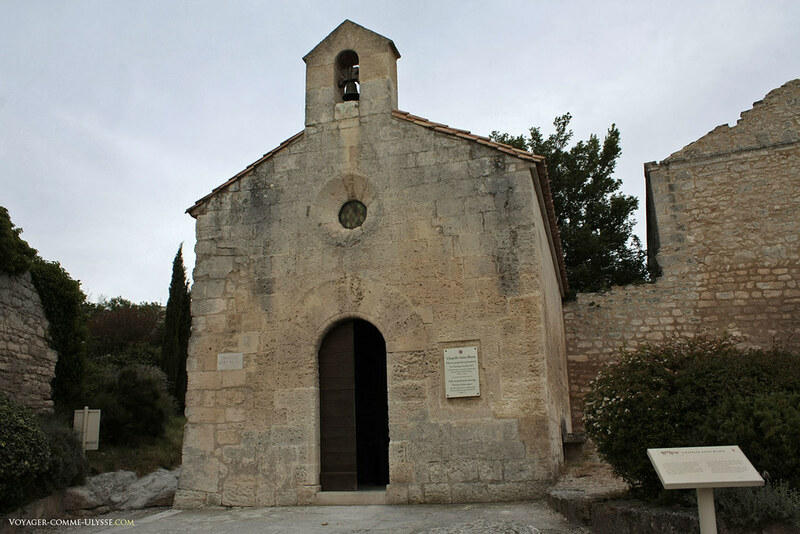 Walking inside you might expect to see relics of the old church but instead, the room has been remodelled as a small auditorium which plays the film 'Provence from Above’. While the film isn't about the history of the castle, it is a loving homage to the landscapes of Provence and if you're here on a hot day, is a nice escape from the sun. Walk out straight, along the path, towards the Costapera plateau. Along the way you'll pass a giant replica of a trebuchet. The trebuchet was medieval siege machine used to attack fortified walls of opposing fortresses during times of war. Large objects were placed inside the trebuchet and catapulted long distances. This particular trebuchet inside the castle was capable of launching boulders weighing 50-100kg over 200 meters! Continuing on the path, head towards the large Windmill along the cliffside. The original mill dates back from 1652. Situated on the edge of the cliff, the windmill was exposed to the most powerful gusts of wind and the town erected the mill here to utilize this natural force. Past the windmill, you can walk out to the view across the entire Costapera plateau. The plateau features a special kind of rock, called calcareous rock, which is a particularly soft, easy to carve rock. It was used in Roman times to create the sculptures, monuments and building facades you'll find in many old Roman cities across Provence, particularly Arles. During the evening hours when the tourists have all gone home, you can sit here and listen to the wind whipping across the landscape. It is immensely peaceful to sit here and simply listen to the music of the Provence. Walking back from the viewpoint stop off at the Charloun Rieu monument. Charles Rieu, now known as Charloun dou Paradou, was a French poet in the 1900s who was influential in writing and reviving the Provencal language and culture. Looking out at the scenery here and touring Provence, you can really see how different this part of the country is and how important their own language would have been to distinguish themselves from the rest of France. It is no surprise then why Charloun dou Paradou is so important. Walking back towards the main entrance, let's take a minute to walk through the large remains of the Quiqueran Hospital. 'Quiqueran' means charity house, and was where the poor and the sick of the city were transferred and cared for. The hospital was run with funds from wealthy donors. It was built in the 16th century during the French Wars of religion when hundreds of thousands of French people were fighting on the front lines. Families lost their heads of household and were left destitute and often the charity houses were the only place they could come to get food and medicine. Although it's hard to imagine now since there are only a few walls left intact, this building used to have three large arched porticos and a second level where the main part of the hospital was located. As we turn in towards the castle's courtyard we pass by the wooden battering ram. The ram is another reconstruction of the kind of warfare instruments which the fortress used to during its historic battles. The "Baume de Roucas" or rock caves were a popular form of residences during the 16th century. Now named Troglodyte Houses, since Troglodyte refers to a person living inside a cave, these rudimentary houses have one of the best views in the entire castle. Although they are very simple and perhaps lack the flash and flourishes of the castle, I wonder if the peasants who once lived here appreciated the natural beauty which their home backed out upon. Standing in the outer courtyard entrance, take a look up to the top of the Sarrasine tower which overlooks the entire area. From the other end of the courtyard, you can access a staircase which leads right out to this lookout point. The tower is known as the “guardian of the Château” since it is the highest point in the castle, where guards would be able to see any incoming invaders. Inside the second courtyard is where you'll find the old residences of the craftsmen and farmers who lived inside the castle walls. During the high tourist season, actors in period costumes recreate life in the castle in the middle ages. During the middle ages, pigeons were one of the most popular forms of communication and therefore the birds were treated like royalty themselves. Their homes were called dovecotes, little niches carved into the rockface. The birds would lay their nests here and their eggs and young babies would be collected using huge ladders by the castle guards. You can still see the holes where the pigeons stayed even today, carved into the remains of the wall. The first courtyard is further into the castle grounds where the Lords and Ladies of the castle would have been found. Along the first courtyard you can still enter various floorplans of old aristocratic residences, rooms carved out of the solid rock. Walking inside they are nothing more than cold, empty rooms but try to imagine them covered in rich velvet tapestries, filled with elaborately decorated furniture and a furry of servants peddling the finest food the province had to offer. At the top of the castle are the remains of the military keep. To prevent attackers from climbing up the side of the mountain and simply entering the castle, the walls of the castle on the vulnerable side of the mountain where built up another 20 meters and at the top, various guard towers were erected to further add another level of protection. Walking along the top of the guard tower provides the best view of the entire castle and the surrounding countryside. When we visited there were only a handful of other people around and none of them ventured up as far as we did so we had the entire place to ourselves! Imagine the entire courtyard below filled with courtiers and servants, jousts and jesters. Guards walking back and forth, head to toe in the finest armour. It must have been such a sight to see. At the foot of the castle was where there was a dry moat which has now been replaced with a reconstruction of where the archers would do their target practice. You can try your hand at shooting crossbows and watch professional archers take aim at various targets. Before leaving, head out to the cliffside graveyard where tombstones of the old villagers of Les Baux are still being buried today. It is heartwarming to see whole families buried together here, generation upon generation. While some people might think graveyards are a bit macabre, I find these gravestones to be a beautiful look into the past and the ways in which those generations honoured their dead. Before heading out of Les Baux, be SURE to check out the Carrières de Lumières, which is just down the hill from the lower town. The Carrières de Lumières is a multimedia light show which is projected onto the walls of an ancient quarry. Tickets for the Carrières de Lumières can be purchased as a combined ticket with your entry to the castle, but if you are looking just to see the show, tickets are €12,5 or €10.5 if you're a student or senior. The show changes every year but always combines famous painting from a particular artist with modern music and dynamic light projections which encapsulate the entire room into a mesmerizing exhibit. There are over 2,000 digital images projected onto over 7,000m2 inside quarry. The projections cover the entire space from floor to ceiling. Viewers can walk around the whole time as different parts of the quarry display different designs and experiences. But if you want to relax you can find one of the many benches or sitting areas and simply sit to enjoy the show. The program is around 20-30 minutes long but I would advise staying for at least 2 cycles to make sure you experience all different aspects of the exhibit from various parts of the quarry. When we visited the show on display featured artworks from Bosch, Brueghel and Arcimboldo featuring a musical score by Luca Longobardi using music from Led Zeppelin. The combination of the antiquated artworks with the modern music was one of the most innovative parts of the show. Bosch, Brueghel and Arcimboldo were all artists who focused on the shifting nature of good and evil. Carefully curated pieces all combine together to create a seamless story of the variant nature of humanity. In addition to modern music, the paintings themselves are animated and move as they are being projected. This brings these paintings to life in a way they've never been seen before. Even the slightest movement turns brings history to life. Hieronymus Bosch’s paintings which are so detailed are blown up larger than life along the walls and ceilings of the quarry. From this perspective, you can inspect the works close up and notice elements of the paintings you've never been able to see before. Check the website to see the theme of the show they are presented this year or just show up and let yourself be surprised. No matter who the artists on show, the love and passion the curators have for transforming the space and bringing art into people's lives in a new perspective is always an absolute treat. Les-Baux is a place you cannot skip on your travels through Provence and I hope you get the chance to experience everything this region has to offer for yourself on your next creative adventure.